Hope everyone had a Merry Christmas. My family had a fruitcake-filled one. With seven fruitcakes in the freezer, someone had to eat them all. First, the Swiss Colony and Wisconsin Cheeseman fruitcakes were discarded without further ado. One has only so many calories at their disposal during the holiday season, and one musn't waste them on bad fruitcake. I assembled the equivalent of a cheese platter with fruitcake: picture above. 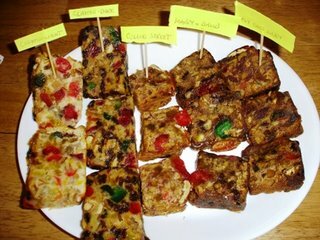 So if you want to see what a slice of each fruitcake looks like, here they are. From left to right, Claxton Light, Claxton Dark, Collin Street, Harry and David, and Holy Cross Abbey. Gethsemani Farms was not included because everyone in the family has their own half-cake sitting at home, courtesy of my mom, who orders them for us each year. The family's opinions of the cakes varied widely. Surprisingly, the Holy Cross didn't get the rave reviews I was expecting (it being so similar to Gethsemani). I think rather the family tried the other ones to get a flavor for the non-Trappist type cakes. Reviews were mixed, but most of these fruitcakes were appreciated for what they were. Some liked the citrusy flavor of the Claxton light fruitcake; others really enjoyed the distinct, almost gingerbread-like flavor of the Harry and David. The Collins Street cake was complimented on its strong pecan flavor. The cake that ranked lowest on the family list? Claxton Dark, of all things. They liked the molasses flavor but felt it was just too "raisiny," without other fruit flavors. Finally, for those of you who just received a fruitcake and really don't want it, there is a fruitcake Safe Haven. Please take advantage of it. You are a princess among women! May all of your fruitcakes be wonderfully tasty! Thanks! Great blog. I have an urgent fruitcake related question I'm hoping you can answer directly - can you email me at jrausafuller@hotmail.com and I'll explain? hi isabelle i agree great blog. i read about it in the suntimes yesterday. i also come from a family of fruitcake lovers. we do not agree about alot but we agree fruitcake it rocks. yes homemade fruitcake is the best. my friend's mother mrs.carr an expert baker carrys on this venerable tradition. have you thought about posting some fruitcake recipes. thank you.